How about a little Brian May or Edward Elgar to rouse you from your slumber? 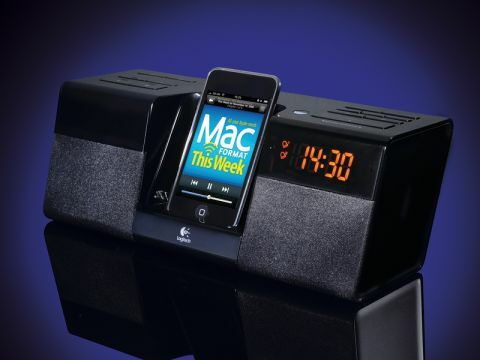 Alarm clock radios – and their made-for-iPod descendents – have always held a strongly diametric level of appeal. For some, a varying pattern of sound waves each morning is a precursor to a missed train, while others are happy to banish the beep and rely on Survivor's Eye of the Tiger to kick-start their day. If you fall into the latter category, the Pure-Fi Anytime might just be your new favourite toy. Logitech entered the alarm clock market last year with the impressive Pure-Fi Dream, though its £170 MSRP afforded it limited appeal. The Anytime serves as its smaller, restrained sibling, focusing on waking you up rather than affective acoustics, while still providing much of the well-realised alarm functionality that made the Dream so appealing. Dual alarms, for example, will entice anyone who gets up at a different time to their partner – and Logitech has gone one better than a basic implementation. Creating bespoke playlists named Alarm 1 and Alarm 2 ensure that no argument over early-morning music taste occurs, and even if you forget to set your ideal soundtrack before you hit the sack, a gentle fade-in ensures you won't be jarred awake. Forget, also, drowsy snooze button fumbling – thanks to an in-built motion sensor, waving in the dock's general direction will silence the alarm clock for a pre-determined interval. This also illuminates the dock's backlit control buttons, including a manual snooze button – though they're fairly hard to push when lying beside the unit and don't provide much tactile feedback. The illuminations it sports are bright enough to be seen in daylight, yet subtle enough not to influence your bedroom's ambient light level. As a speaker dock, audio quality isn't very inspiring. Unlike dedicated iPod speakers that put fidelity foremost, the Pure-Fi Anytime is designed primarily as a timepiece. We're not inclined to penalise its bass deficiency too heavily; after the initial few mornings' excitement has worn off, you'll rarely get further than ten seconds into any one song before dismissing it with a disgruntled flail. Our main issue is how uni-directional the speakers are; unless the unit faces you directly, what treble there is simply disappears. In the box there's an AM loop antenna, various dock adaptors and a remote control, though unless you prefer to sleep ten feet away from any electrical equipment the latter is likely to see only occasional action. The screwdriver-accessed 9v backup battery may be a little clumsy, but it does mean that you won't miss your alarm in the event of a power failure during the night.